Okan Tower is one step closer to beginning construction. On September 1, contractors filed a dry run permit to begin building a 70-story tower, city records show. Next week, a phased Class II foundation permit will be filed, along with a master building permit, a consultant working for the developer said. The hotel will be known as the Hilton Bayfront. 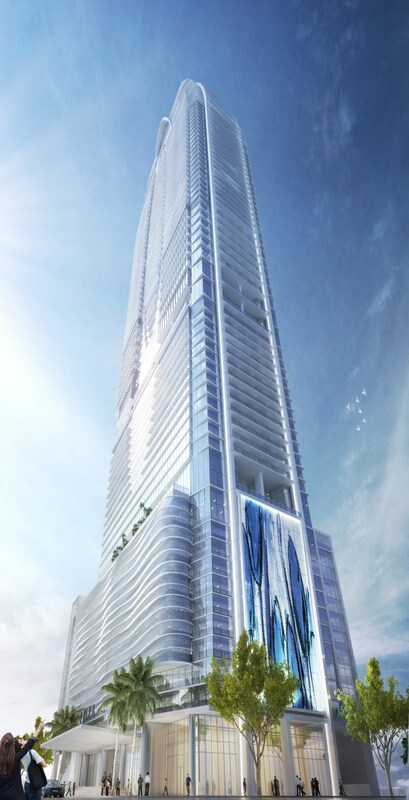 Okan representatives previously told The Next Miami that the tower will top of at 890 feet. Stunning…truly a magnificant rendering can only hope it resembles this once complete. Will serve as the anchor south of worldcenter exciting stuff!! I hope this beauty ends up looking as good as the renders. Amazing landmark for this downtown. This building will make a magnificent center piece when viewing the skyline from east to west. these developers are smart people and would not commit millions and millions if they didnt believe miami is becoming something really special…maybe they know things we dont….genting….amazon or the influx of financial firms relocating here…all these buildings going up means a great city is being formed….please please city leaders…build transit options and quit stalling as if you are personally paying for expansion of transit…. For an area that had almost nothing a little over 100 years ago, is truly magnificent. I mean this building has alot of Turkish money going into it since the Turkish market has been tanking. Curious if any of the readers has bought a unit? If any reader bought a unit, why would they be here commenting before the building is done and they’ve moved in? Stop being a jerk, that was a good question. I do have clients from Abu Dhabi who are very interested, I am looking forward to showing it one day. Hey dumb dumb, I hardly doubt that you have clients with the finances to afford living in this building. Furthermore, the difference in showing someone the finished product versus a picture is like looking at a picture of a car on the internet or seeing it in person and test driving it. Go back to sleep, you’re stupid beyond belief. Are there no new post this week? The Next Miami will be on vacation through Tuesday, September 11. We return on Wednesday, September 12. Any news on when Marriott Worldcenter will file for a construction permit? Seems like there’s no way that project will breakground before the end of 2018. Makes sense – get Lira’s out ASAP and invest is safe Dollar-based asset. They’re almost not moving fast enough on this… go! go! go! Hopefully they don’t pull a PMG and chop the top off like Echo Brickell. Not the best location (in my opinion) for a super-high end tower. Needs to be closer to water. Bayfront? It’s a full 4 blocks away. How about just Hilton Downtown.